A four double bedroom contemporary detached barn conversion, for sale with no upper chain and with open plan living, in the village of Hexton. 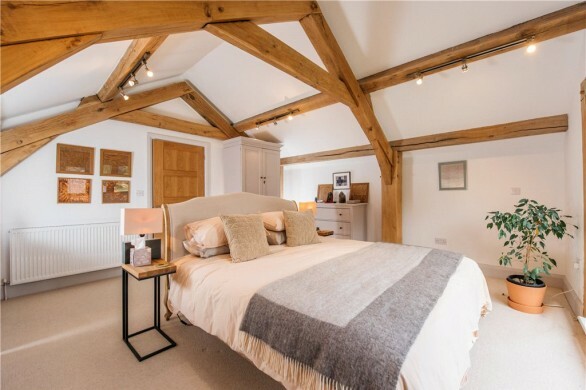 Adjacent to woodland and situated in the centre of the village, Red Lion Barn is an outstanding timber framed property offering versatile accommodation in excess of 2,000 sq. ft., set over two floors. Constructed and fitted to an exceptional standard to provide stylish and unique family accommodation and has a valid Builder Insurance Backed Warranty. Complementary features of the property include oak flooring throughout the reception areas, numerous exposed oak beams, vaulted ceilings and oak internal doors. 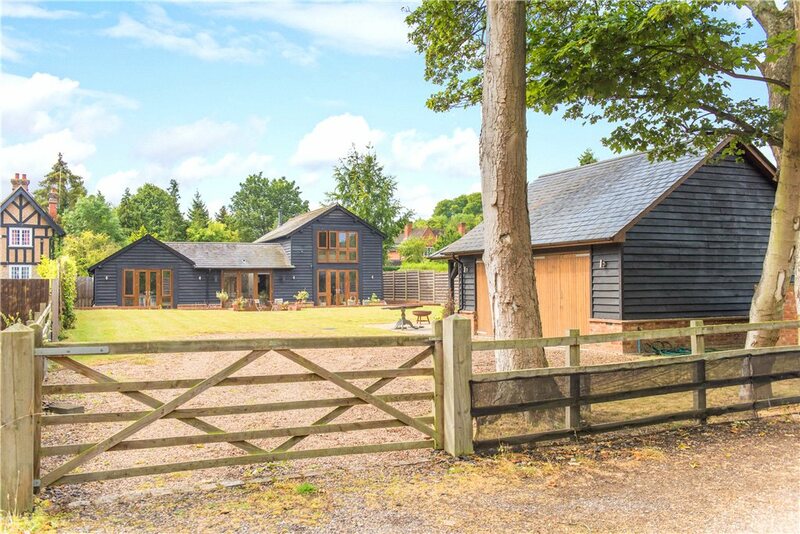 Externally, the property boasts a gated front and rear driveway, with a detached double garage and home office. The oak front door opens into the entrance hall, which has recessed downlights, underfloor oak heating, stairs to the first floor, and oak doors to the cloakroom and reception areas. 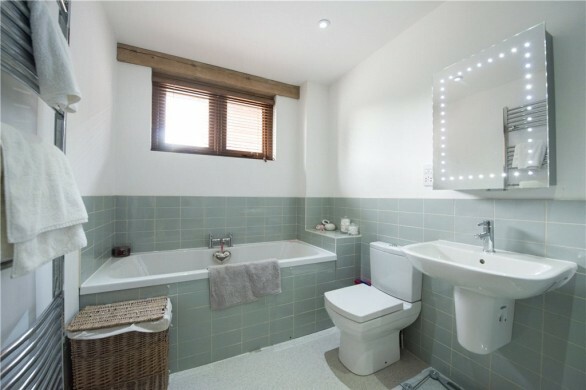 The cloakroom has a window to the front, a white suite compromising low level WC with concealed cistern, a wash hand basin set into a vanity unit with a mixer tap over, a towel rail, tiled flooring, with underfloor heating, and recessed downlights. 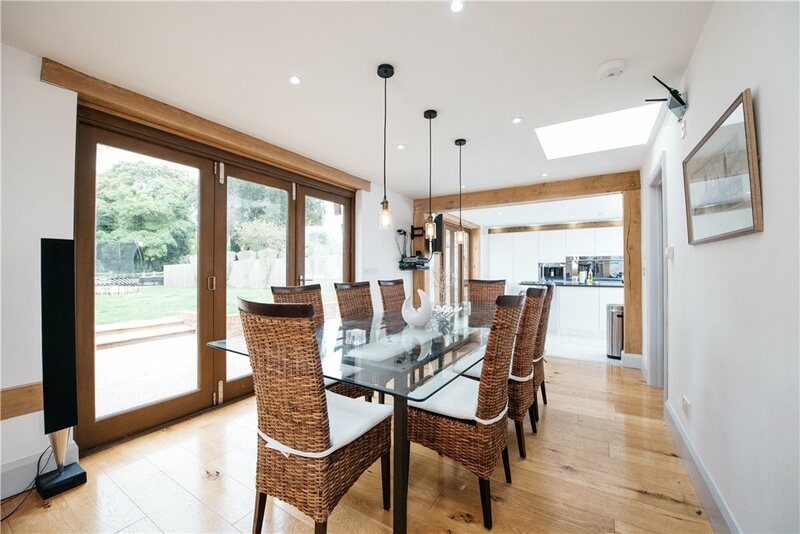 A light and spacious dining area with tri-fold sliding patio doors to the garden, oak flooring, underfloor heating, two skylights, one of which is electronically operated, exposed oak beams lit by recessed downlights and three stylish uplighters. The utility room has a window to front, recessed downlights, an extractor fan and tiled flooring. 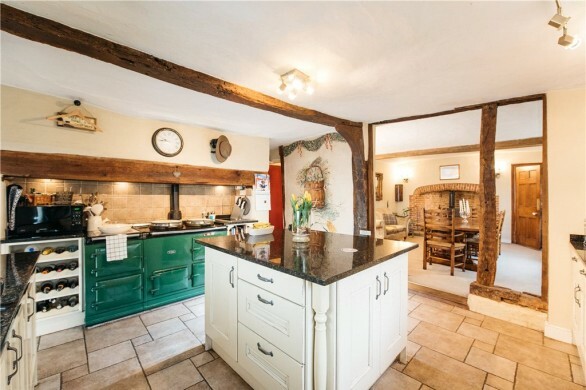 The worktop incorporates an inset stainless steel sink and drainer with a mixer tap above, and a cupboard below. There is space for a washing machine and a tumble dryer. The utility room houses the wall mounted boiler, for the air source central heating system, and the pressurised hot water tank. 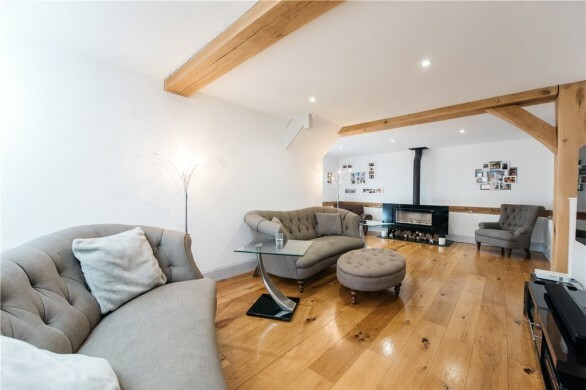 The open plan sitting room is in excess of 30 ft. long. 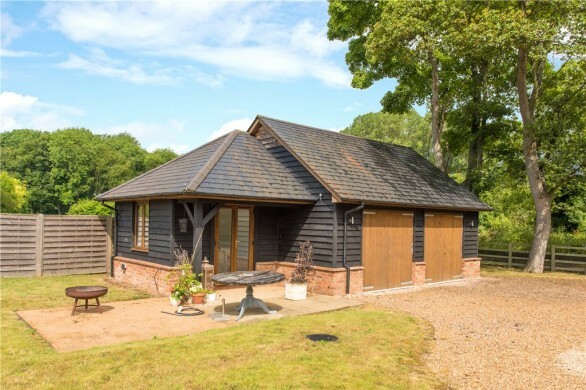 There are casement doors and windows to the rear garden, and a further window to the side, together with exposed oak beams, underfloor heating, oak flooring and a built-in storage cupboard. 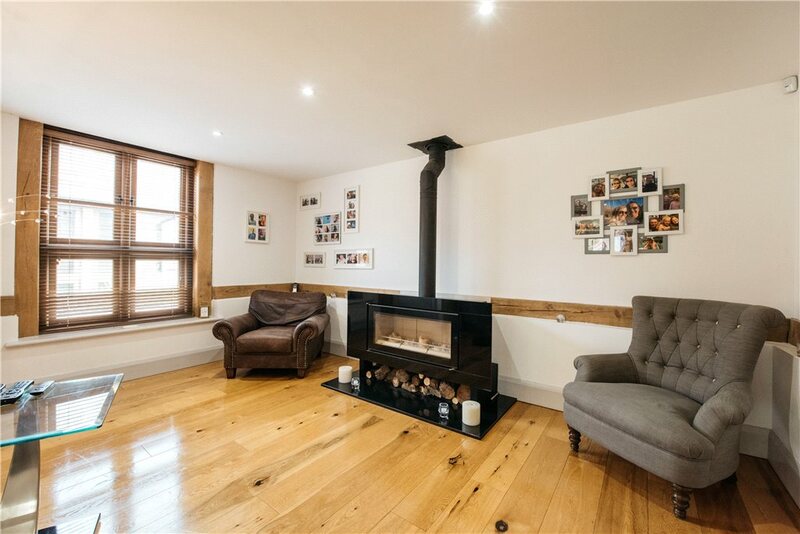 The sitting room benefits from a contemporary wood burning stove that, to date, has not been used. The dual aspect kitchen has a range of fitted wall and base level units and a central island with Quartz worktops over. There is an inset Blanco stainless steel sink with a mixer tap. The island has a breakfast bar, a further stainless steel sink with a mixer tap over and pop-up multifunctional electric sockets and USB points. 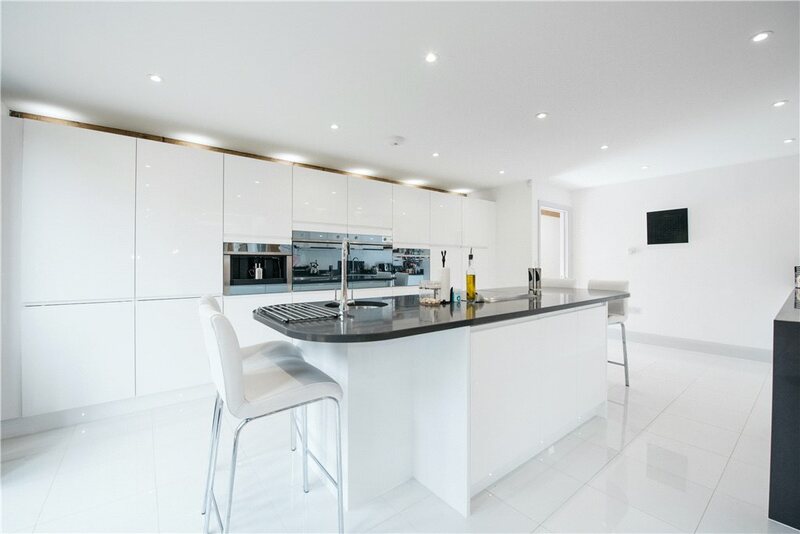 Integrated appliances include a Smeg ceramic hob with a down draft extractor unit over, a dishwasher, a microwave, twin ovens, a coffee machine, a tall larder fridge and a tall larder freezer. 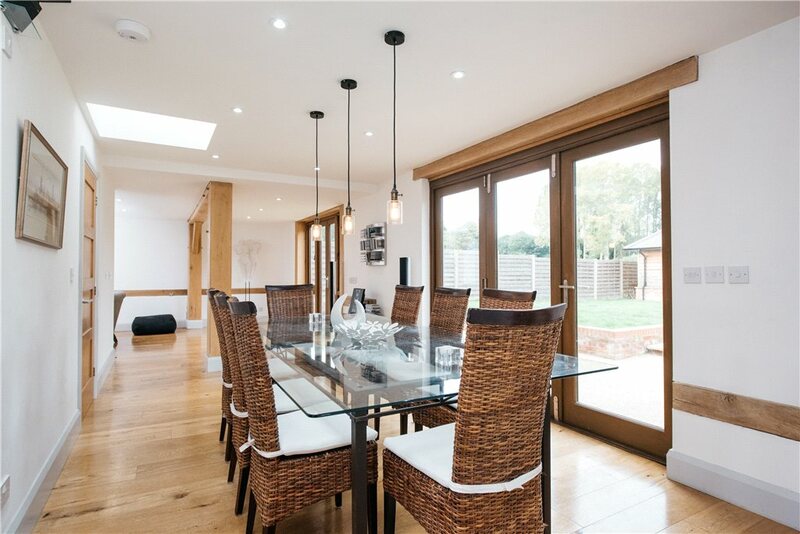 There is kick space lighting, under unit lighting, tiled flooring with underfloor heating, recessed downlights and exposed oak beams. Casement doors open to the rear garden. 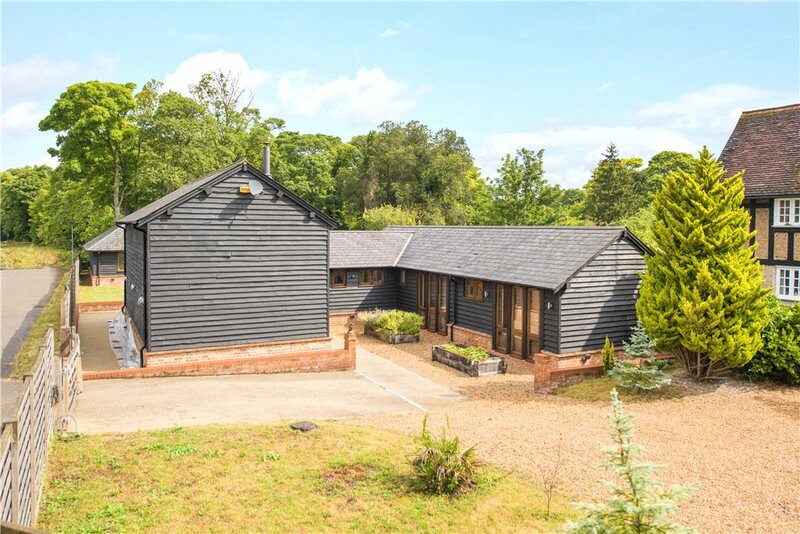 An inner hall with exposed beams, recessed downlights and carpet with underfloor heating provides wing access to bedrooms three and four, and the family bathroom. Bedroom three has windows to front, exposed beams, access to the loft, recessed downlights and carpet with underfloor heating. Bedroom four has windows to the front, exposed beams, a vaulted ceiling, recessed downlights and carpet with underfloor heating. 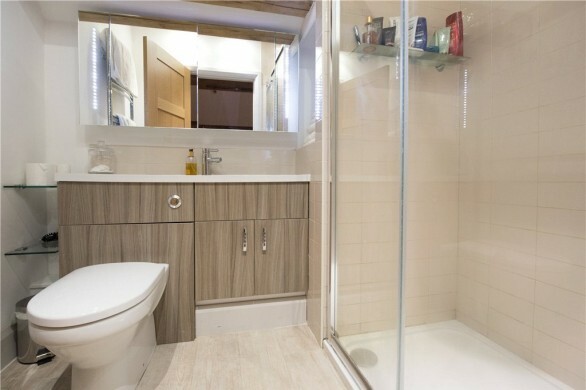 The bathroom has a panel enclosed bath with a rain water shower head over, a low level WC, a wash basin, a corner shower cubicle, a heated towel rail, a shaver point, resin bonded flooring with underfloor heating, exposed beams, recessed downlights and a window to the front. 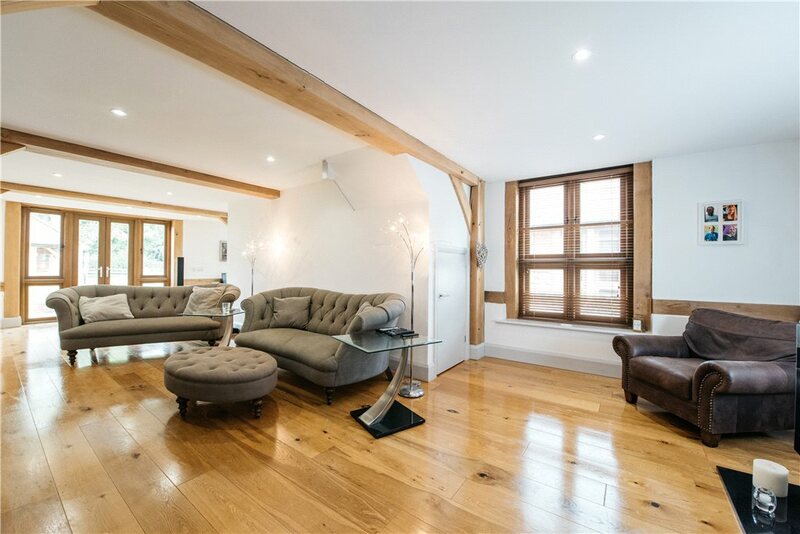 The impressive vaulted master bedroom has a gable window with views over the garden and adjacent woodland, together with exposed beams. Bedroom two has views over the entrance area, a window to the side and exposed beams. The shower room has a vanity unit with a wash hand basin, a low level WC, a double shower cubicle with a rain shower head over, tiled splash areas, a heated towel rail, an extractor fan, a shaver point, exposed timbers and recessed downlights. The low temperature air source heating system absorbs heat from outside air and releases it inside the building, to provide hot water for radiators, underfloor heating and domestic hot water. 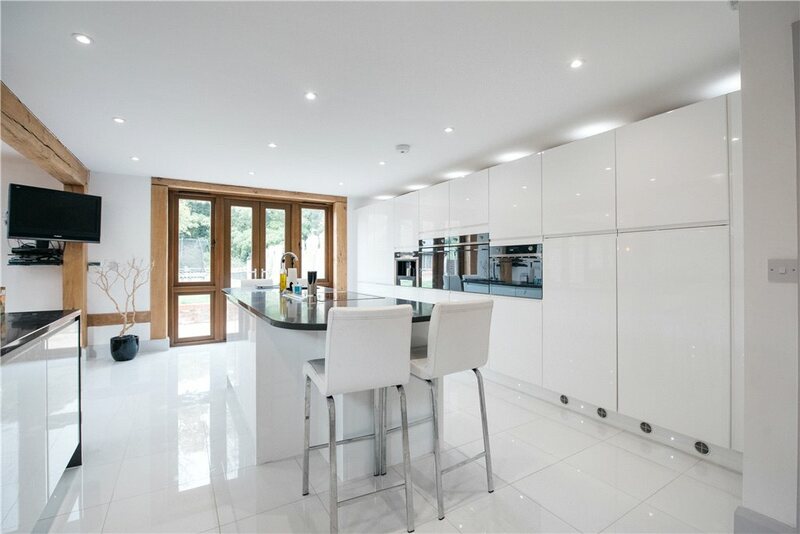 The system offers state of the art central heating and domestic hot water. The air source is located behind the garage enclosed in brick casing. The property stands back from Barton Road and screened by mature trees, shrubs and tall woven fence panels. 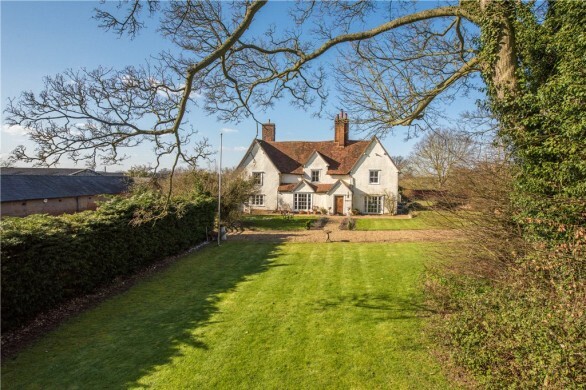 Access is gained via a five bar wooden gate and the drive is large enough for several cars and surrounded by mature flower and shrub beds, and lawn, which extends to an open courtyard, which has herb and flower boxes. There is contemporary external lighting on dusk/dawn timers, an outside water tap and external electrical sockets. 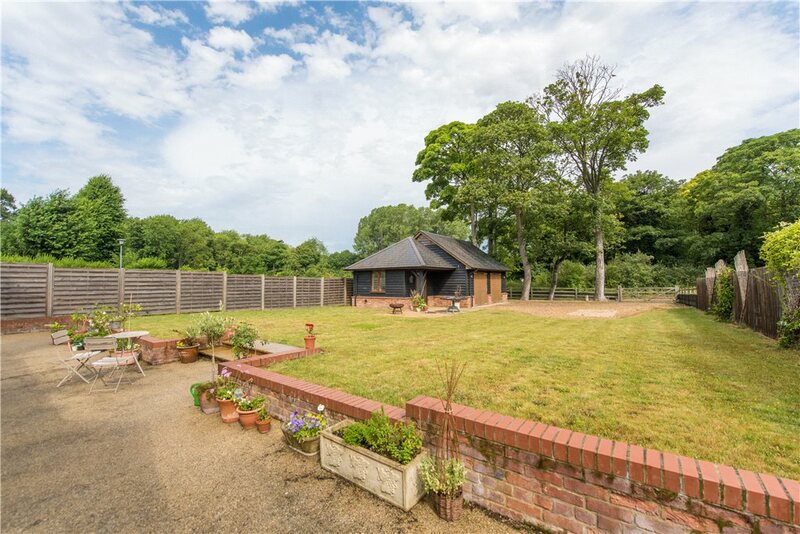 A side path leads to the rear garden, which is mainly laid to lawn with woven fenced boundaries, a rear driveway with a five bar gate entrance with further parking for several cars, access to the double garage, equipped with lighting and roof space. A sun terrace patio area serves the back of the property along with dusk/dawn external lighting and electrical external fly traps for alfresco dining. 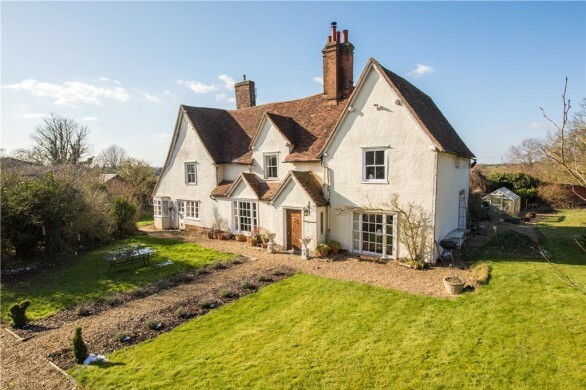 The picturesque village of Hexton is situated on the edge of the Chiltern Hills, just 6 miles out of the historic market town of Hitchin. Hitchin train station is approximately 6.5 miles away, from where commuter trains to Kings Cross take just 30 minutes. The village benefits from having its own public house, with a restaurant, a Junior school and is within priority catchment for both Hitchin Boys&#039; and Hitchin Girls&#146; Schools.